In Dialectical Spiritualism (a book in manuscript), Srila Prabhupada examines with his disciples the ideas of the West’s major philosophers. What follows is taken from his discussions about Aristotle. Disciple: Aristotle constructed a system of abstract notions and principles—”matter,” “form,” and “privation”; “potency” and “act”; the ten categories; the four kinds of causes; and so on—which he tried to show were universal in scope, capable of explicating reality on all levels. He wanted to show how all of reality is thus intelligible. Aristotle thought of the cosmos as a hierarchy. At the bottom is prime or pure matter, which possesses no intelligible essence, or “form”; it is pure potency, without actuality. And at the top is God, the unmoved mover of the whole system, who is pure actuality (He is all that He could ever be), sheer form, pure intelligible, intellectual essence, with no tinge of matter or potentiality. In between are the changing substances compounded of matter and form—the elements, minerals, plants, animals, humans, and the ethereal intelligences that move the stars. The higher up the scale you go, the more form predominates over matter. In this way, Aristotle rejected the separation between the world of forms and the world of matter that characterized the philosophy of his teacher, Plato. One modern philosopher has observed that Aristotle’s conception of God was motivated entirely by dispassionate rational concerns—no extraneous ethical or religious interests influenced his idea—and that this did not go far toward producing an idea of God available for religious purposes. “Now hear, O son of Prtha [Arjuna], how by practicing yoga in full consciousness of Me, with mind attached to Me, you can know Me in full, free from doubt.” This is the process of Krsna consciousness. Of course, we may speculate about God, and if we simply think of God that will help us to some extent. If we are in darkness, we may speculate and concoct ideas about the sun. This is one kind of knowledge. But if we actually come to the light, our knowledge is complete. We may contemplate the sun in darkness, but the best process is to come into the sunshine and see for ourselves. He is pure form, without potentiality or matter. But man is a combination of matter and form. Since man is form and matter, he is imperfect, less than fully real or realized. This imperfection is inherent, being located in matter or potentiality. Srila Prabhupada: That is nonsense. Man is not made of matter but is covered by matter. Man is, made of spirit. If God is spirit, man is, also spirit. In the Bible it is also said that “man is made in the image of God”; therefore man is originally perfect. A person is generally supposed to be healthy, but if he falls into a diseased condition, it is not his imperfection. It is something external which has attacked a healthy man. According to his original nature, the living entity is healthy, or in other words, pure spirit. Disciple: Although Aristotle criticized the Platonic separation between matter and form, his evaluation of these two was much like that of his teacher. Matter for Aristotle is unknowable and unintelligible, of no intrinsic worth; it is the cause of imperfection, change and destruction. Form alone is the object of knowledge, the really real, the unchangeable and enduring; it alone endows the world with meaning, intelligibility, and intrinsic purpose. Srila Prabhupada: This means that the Supreme Absolute must have form. Isvarah paramah krsnah sac-cid-ananda-vigrahah. The word vigrahah indicates form. That form is not dead but is the activating spirit. Krsna’s form is sac-cid-ananda: eternal, fully cognizant, and blissful. Our bodies are neither fully cognizant nor fully blissful, but Krsna’s is. He knows past, present, and future, and He is always happy. Our knowledge is limited, and we are always full of anxieties. Disciple: For Aristotle, form gives changing things an immanent goal or purpose—entelechy. Therefore all matter has some form for its actualization. The world is an unfolding of phenomena realizing themselves. In other words, nature is driven by purpose. Srila Prabhupada: We agree with this. According to the Padma Purana, there are 8,400,000 various forms, and none of them is accidental. According to karma, one receives a particular form. Lord Brahma receives his form according to his karma, and the dog or cat receives its form according to its karma. There is no question of accident. Nature unfolds in accordance with a plan, by virtue of which these various forms are existing. Yas tv indra-gopam athavendram aho sva-karma-bandhanurupa-phala-bhajanam atanoti. From Indra down to the indragopa, a microscopic germ, all living entities are working out the results of their karma. If one’s karma is good, he attains a higher form; if it is not good, he attains a lower form. There is a process of evolution. The living entity passes from one species to another, from fish to trees to vegetables to insects to birds, beasts, and humans. In the human form, the result of evolution is fully manifest. It is like a flower unfolding from a bud. When the living entity attains the human form, his proper duty is to understand his lost relationship with God. If he misses this opportunity, he may regress. Aristotle is correct, therefore, when he says that everything has a purpose. The whole creative process aims at bringing the living entity back home, back to Godhead. Disciple: Does every living entity eventually come to that point? Srila Prabhupada: As a human being, you can properly utilize your consciousness, or you can misuse it. That is up to you. Krsna gives Arjuna instructions and then tells him that the decision is up to him. Under the orders of Krsna, nature has brought you through so many species. Now, as a human, you can choose whether to return to God or again endure the cycle of birth and death. If you are fortunate, you make the proper choice according to the instructions of the spiritual master and Krsna. Then your life is successful. Disciple: Aristotle sees a hierarchy of forms extending from minerals, vegetables, and animals up to human beings and ultimately God, who is pure form and pure act. God is devoid of all potentiality or materiality. 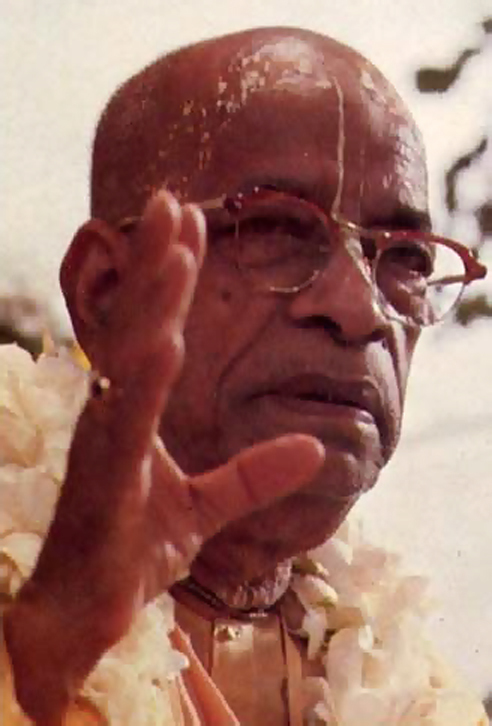 Srila Prabhupada: Of course there is a hierarchy. And the individual soul transmigrates from one form to another. That is a fact. But who is to say that the next form you attain is closer to perfection? If you have a human form this life, there is no guarantee that you will get a higher form in the next. You accept another form just as you accept another suit of clothes. Those clothes may be valuable or of no value whatsoever. You get your clothes according to the price you pay, and you accept a form according to your work. Similarly, you bring about your own form, and you enjoy or suffer according to your work. In any case, a material form is never perfect, because it undergoes six changes. It is born, it grows, it stays for a while, it leaves some by-products, it dwindles, and then it vanishes. When your form vanishes, you have to take on another form, which also undergoes the same processes. When a form vanishes, it decomposes, and its various elements return to nature. Water returns to water, earth returns to earth, air returns to air, and so forth. Disciple: Aristotle’s God is the unmoved mover. He is perfect, and He wants nothing. He does not have to actualize Himself, because He is completely actualized. Srila Prabhupada: We also agree that God is all-perfect. Parasara Muni defines God as the totality of wisdom, strength, wealth, fame, beauty, and renunciation. All these qualities are possessed by Krsna in full, and when Krsna was present, everyone could see that He was all-perfect. One who is perfect can rule others, and we accept the leadership of a person according to his degree of perfection. If one is not somewhat wise, beautiful, wealthy, and so forth, why should we accept him as a leader? And one who is supremely perfect in all these qualities is the supreme leader. That is natural. Since Krsna is supremely perfect, we should accept Him as our leader. Disciple: God is pure form or actuality, without matter or potentiality. But for Aristotle form without matter means thought. Therefore, he considered God to be entirely mind or intellect (nous) and the divine life to be the life of the mind. God’s perfection requires this. Srila Prabhupada: When he said that God is mind, what did he mean? Did he have some conception of God’s personality? God must be a person, otherwise how could He think? Disciple: Aristotle said that God’s activity was thought, and that his thought had itself as its sole object: God’s thinking is noesis noeseos, thinking of thinking. Thus His nature is self-contemplation. Disciple: But is it not possible to meditate while acting? Srila Prabhupada: Certainly, but God doesn’t have to meditate. Why should He meditate? He is perfect. One meditates to come from the imperfect stage to the perfect stage. Since God is perfect to begin with, what business does He have meditating? Everything is simply actualized by His will alone. Aristotle recommends that a man should meditate to become perfect. This meditation presupposes imperfection. Contemplation is recommended for conditioned living entities, but we should understand that God is never conditioned or imperfect. He is so powerful that whatever He desires or wills immediately comes into being. This information is given in the Vedas. Parasya saktir vividhaiva sruyate. God’s multi-energies are so powerful that everything is immediately actualized as soon as He desires. Disciple: But what about the meditations of the Buddha? 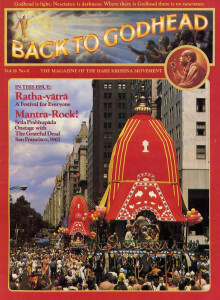 Srila Prabhupada: Buddha’s mission was different. He was setting an example for miscreants who were engaged in mischievous activities. He was recommending that they sit down and meditate, just as you tell a mischievous child to sit in a corner and be quiet. Disciple: Aristotle never really says that we should end our activities. But he does say that we should contemplate God. Disciple: Aristotle reasons that if God were to know changing things, it would entail change in God Himself. Thus it seems that Aristotle’s God has no knowledge of the world. This means that He cannot return the love He receives. He neither loves nor cares for mankind. “As one surrenders unto Me, I reward him accordingly. Everyone follows My path in all respects, O son of Prtha.” When we fully surrender to God in loving service, we can actually understand God’s nature. Disciple: God causes motion in the world not actively but by being the object of desire. He moves the world the way the beloved moves the lover. In spite of His being the supreme object of thought and desire, there is no mention of His being a person. On the contrary, He seems to be merely a sort of consciousness that has no object save itself. Srila Prabhupada: It appears that Aristotle is a Mayavadi, an impersonalist. One has to speculate if one does not receive perfect knowledge from God Himself. Disciple: But at least the idea of God’s moving the world by attraction shows some idea of God as the all-attractive. Srila Prabhupada: Unless God is all-attractive, how can He be God? Therefore the word Krsna, which means “all-attractive,” is the perfect name for God. God attracts everyone. In Vrndavana He attracts His parents, the cowherd boys and girls, the animals, the fruits and flowers, the trees—everything. Even the water was attracted to Krsna. The Tenth Canto of Srimad-Bhagavatam describes how the water of the River Yamuna would become stunned in ecstasy and stop flowing as soon as she saw Krsna. Disciple: Aristotle had the idea that God was totally unified, without duality. In what way would you say that God’s thought and His activity are one? Srila Prabhupada: God need only think of a thing in order for that thing to be created or actualized. God’s thinking, feeling, willing, and acting are the same. Because we are imperfect, when we think of something it may or may not happen. But whenever God thinks of something, it takes place. Because Krsna thought that the Battle of Kuruksetra should take place, there was no stopping it. At first Arjuna declined to fight, but Krsna plainly told him that whether he fought or not, almost all the warriors there were destined to die. He therefore told Arjuna to become His instrument and take the credit for killing them. No one can check what God decides. It doesn’t matter whether you help God or not, but it is in your interest that you become His instrument. Srila Prabhupada: Yes, that is the process of bhakti, devotional service. But unless one is a devotee, how can he constantly think of God? Srila Rupa Gosvami gives the example of a married woman who has a paramour. She performs her household chores very nicely, but she is always thinking, “When will my lover come at night?” So if it is possible to think of an ordinary person all the time, why not God? It is simply a question of practice, of developing your attraction for Him. Then, despite engaging in so many different types of work, you can think of God incessantly. Now, Aristotle may have some conception of God, but he has no clear idea of Krsna’ s personality. We can think specifically and concretely of God because we receive information from Vedic literature that God is a person and appears and acts in a certain way. In Bhagavad-gita it is stated that impersonalists experience a great deal of trouble because they have no clear idea of God. If you have no conception of God’s form, your attempt to realize God will be very difficult. Disciple: For Aristotle, God is known by speculative reason, not by revelation. “I am never manifest to the foolish and unintelligent. For them I am covered by My internal potency (yoga-maya); and so the deluded world knows Me not, who am unborn and infallible.” It is a fact that unless God reveals Himself, He is not known. Therefore He appears, and great authorities like Vyasadeva, Narada, Sukadeva Gosvami, Ramanujacarya, Madhvacarya, and Caitanya Mahaprabhu—great scholars and transcendentalists—accept Him as He reveals Himself. Arjuna saw God face to face, and he accepted Him. When we are freed of ignorance by our service to God, God reveals Himself.